My mom makes the perfect chocolate chip cookie. Go ahead and argue with me if you want, but in the end, when you try them you will agree. My mom used to make large batches of these cookies and then include extras in our lunches for school. She always gave us extras so we could trade with other kids. You have no idea the treats I could get for one of my mom’s cookies. They are seriously that delicious. Once at a church potluck, somebody stole the plate her cookies were on so they could figure out who made the cookies and get the recipes. Now that I have talked them up do you think they can live up to the hype? You betcha! Cream butter, shortening and sugar together until it is fluffy and the sugar is dissolved. Add eggs and vanilla while these are mixing. Add the dry ingredients and mix well. Slowly add the chocolate chips. Drop onto an ungreased cookie sheet. Bake at 375 degrees for 8-10 minutes or until lightly browned. The cookies may look slightly under cooked when removed from the oven, but they will continue to cook as they cool. This will ensure a softer cookie. Does your mom have a signature cookie? I seriously just looked in the kitchen to see if I have all of these ingredients. Need to buy shortening and then these cookies will be MINE! 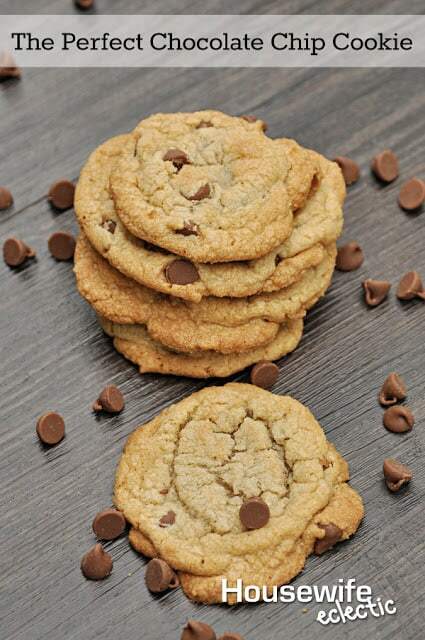 Chocolate chip cookies are the holy grail of recipes. There are so many very good ones. But to find the perfect one…heaven! These sound so yummy. I need a dozen and cup of coffee. Oh man, these look amazing. I need to add shortening and PB chips to my shopping list so I can make these this weekend! Nice looking cookies! I'm not really a sweet fan, but I love a good biscuit (as we call them) occasionally. I am gonna try making some vegan cookies soon! My Mom does not bake and I am no good at it although reading this makes me want to try once again. They do sound really delicious! Great simple recipe! A must try for sure! These look delicious, Debra! There is no better comfort food like warm homemade cookies! I always think of my mom's cutout cookies as "her" cookie. They are so good! Mom's signature cookie has long been the no-bake chocolate peanut butter cookies. She'd make them in batches so big the cooling cookies would cover the entire kitchen table and are my Uncle's favorite so, these days, she only makes them when comes to town. Thus they're also known as "Uncle Peanut Cookies." The only cookies my mom made when I was growing up was Christmas cookies. But even though it was only once a year, it was always and extra special time in the kitchen with her :). I love cookies and I try to make them with my little one about once a month. I don't have a signature cookie, nor does my mom but we both like to bake! Um, YUM. These look absolutely delicious. I may need to make a double batch! I love your photo. I don't think my mom baked a cookie in her entire life, but my grandma made some buckwheat cookies to die for. I love chocolate chip cookies. I don't usually use shortening though. I have actually never used shortening, but I've always wanted to tr. These look amazing! My boys love chocolate chip cookies, I'm gonna try your recipe! These look great. Perfect for this time of the year. Thank you for sharing with us at #HomeMattersParty .We would love to have you again next week.